Poynt Smart Terminal Product Page – Buy the Poynt Smart Terminal from Silver Sky Soft. Accept all types of payment types – Magnetic Strip, Chip Cards and Apple Pay. The Poynt Smart Terminal is an all-in-one smart device you’ll actually want to have on your counter. Accepts all of today’s and tomorrow’s payment types – Magnetic Swipe, Chip Cards (EMV), NFC – Apple Pay and more. And with the Poynt HQ smartphone app, you can manage your terminal and business from anywhere. Poynt Smart Terminal is beautiful and feature packed device ready for the future. PCI Compliant and certified to all the three and four letter acronyms: PCI PTS PED and SRED 4.0, End to end encryption with TLS 1.2. Comes with a built-in cameras for scanning and integrated printer. You can also connect to your existing cash drawers, scanners, registers — whatever via USB on the docking station, so you can do business however you like to. Also comes with WiFi and 3G options. Accept Apple Pay, Android Pay, Samsung Pay, and everything else. 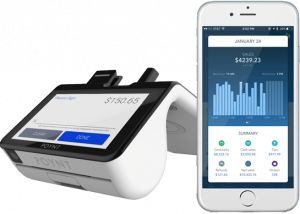 The Poynt Smart Terminal is built to process a wide array of payment methods. Its powered by an operating system that stays up-to-date in real-time, and a SDK that evolves as business does. All brought to life by a dynamic App Store to satisfy your business needs. Poynt HQ is a command center for your business where you can monitor your sales, refund transactions, get business insights and alerts, see your best customers, settle with one click — plus a ton more..
There’s a big beautiful touch screen for you — plus a dedicated screen for your customers. Customers can select their receipt preferences (print, email, none), choose a tip (without all the awkwardness), and digitally sign or enter pin for their transaction (if applicable). 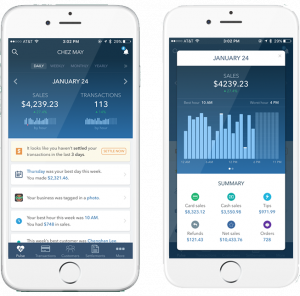 Poynt Store provides access to Apps you need for your business. An open Android based SDK allows Android developers to create apps creating rich app store. Poynt OS is an Android based operating system. It provides a strong platform for development of payment and business related apps with a Poynt SDK. This is a platform for developer’s joy. If you know how to program in Android, you’ll feel right at home. Start writing apps today! Smart Card: 500,000 reads. MSR: 300,000 swipes.